It’s been intriguing jumping in to City of Bones, the first book in The Mortal Instruments series after reading Clockwork Prince and Clockwork Angel. I was already acquainted with the world of shadowhunters, albeit in another era and place: Victorian England. 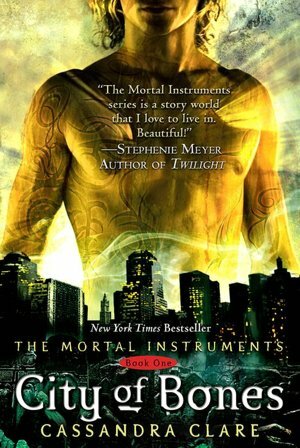 City of Bones takes place in modern day New York City, and while at first I was a bit hesitant, worried that the contemporary setting wouldn’t feel authentic, I loved the mash up of the mythic world of shadowhunters (demon hunters) and downworlders (vampires, fairies, werewolves, warlocks) in our contemporary time. Having lived in Brooklyn for five years before moving out west, I could place almost all of the locations and believe me, there are more than a few alleys and corners where you would not be the least bit surprised to happen upon some other-worldy action. It’s this nuanced balance between fantasy and our own mundane universe, that Clare handles so expertly here. The main character of this series is Clary Fray, a fifteen year old who lives with her mother. Clary is a tiny wisp of a girl with red hair and green eyes. Things start to get weird when she stumbles inadvertently onto several shadowhunters her age who are in the midst of killing a demon in a hip New York club. Clary becomes inextricably linked to them when her own mother is kidnapped by a demon and she is forced to look to the shadowhunters to help her discover the many secrets buried in her past, which if unlocked might help her unravel this mystery. There is also a compelling cast of supporting characters who are dealing with their own individual struggles that helped round out the story, giving it added depth. I was particularly drawn to Alec, a young shadowhunter who is coming to terms with the fact that he is gay in a world, parallel to our own, where it would be unacceptable for him to admit this to his family and his society, without them rejecting him outright. This secret pain he must shoulder is a subtle yet touching moment in the narrative, where we see that when the shadowhunters aren’t grappling with forces of mythic darkness, they must face their own, very human, demons in order to become their true selves. What really pulled me to Clary was her strong personality; she may be short and look a few years younger than her real age, but she never holds back when it comes to speaking her mind. She often says what other characters are thinking, but are too afraid to say aloud, despite the fact that they are warriors and trained soldiers. It’s this fierceness and internal strength that marks her as a unique heroine. Clary’s every fiber screams to be heard and taken seriously. She is the poster-child for those who have been overlooked and undervalued because of outside appearances. The story revolves around Clary coming into her own, and growing up, as she is thrust in to a great responsability that she didn’t ask for. In a way, she reminded me of Frodo from The Lord of the Rings, only if he had a touch of teen angst, a biting wit, and had told Boromir exactly what he thought of him and why he was wrong, instead of running away.